I LOVE this series and cannot wait for the third book to come out. When I read the first book in the series it took me a little while to adjust to the writing style of the author before I started to really love the characters and the plot. The books don’t necessarily have an ending, it’s more of a continuation and makes you want more. Kwan thoroughly thought out the characters and you can’t help but fall in love with Rachel, Nick, and of course, Astrid (!). The second book was laid out a little differently style-wise than the first but it’s easy to adjust since most of the characters are the same but there are some plot twists and new characters. Overall an awesome read! 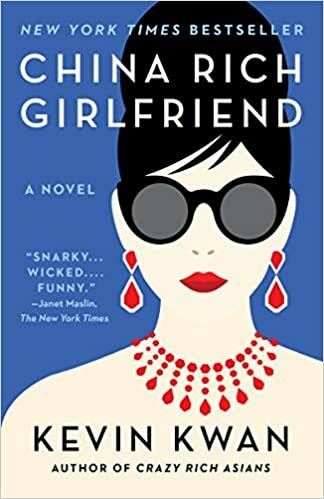 I absolutely loved this book and of course must start by saying that you really need to read “Crazy Rich Asians” (Book One) before you even pick this up because some of the more subtle story lines will fall flat without that back drop. Above everything else, what I appreciated the most was that this mini series actually provided resolution to the most important stories. There were some characters from the first book who fizzled away without explanation, and a couple of twists that seemed to come out of left field, but none of that changed the fact that I devoured this 400+ page book and enjoyed every minute of it. Rachel is all set to marry Nick Young, her boyfriend from a wealthy family, when his meddling family just can’t keep from messing with Rachel’s world. Nick’s mom uncovers secrets no one should ever know that expose Rachel to Shanghai’s most elite and all the issues that come with. Astrid’s story with Michael still unravels and Kitty Pong continues to shock the world with her existence in a rich world. All the gossip of a fashion world and controversy over Asian money in one place. MUST MOVE ON TO BOOK 3 NOW!